Europe requires space-borne laser instruments that can provide information on the vertical scale of volcanic ash clouds. That was one thought to come out of a meeting of some 50 experts gathered this week in Frascati, Italy, to assess Iceland's Eyjafjallajokull eruption. Such information can be used to work out ash concentration and thus determine the risk to aircraft engines. The US Calipso lidar was shown to be very effective in returning this data. Currently, the European Space Agency (Esa) has two lidar (light detection and ranging) missions of its own in preparation. ADM-Aeolus and Earthcare will be launching later this decade. Neither has been driven by the needs of volcanic ash monitoring. Aeolus will study the wind; Earthcare will profile normal weather clouds. Nonetheless, like the American Calipso spacecraft, their technology - they fire pulses of light into the atmosphere and catch the backscatter from particles - can be used very effectively to determine the thickness of drifting ash plumes. If the vertical profile is combined with the known extent of the plume, a concentration can be calculated. The airlines at this time are working to a safe limit of four milligrams of ash per cubic metre of air. The performance of current space sensors and the wish-list for future technologies were discussed during a two-day meeting at Esa's Esrin Earth-observation centre. 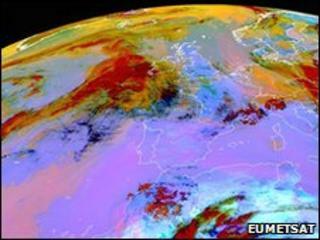 The space agency organised the gathering jointly with Eumetsat, which operates Europe's weather satellites. The summit brought together representatives of civil aviation authorities, ground-based and in-situ observation experts, modellers and satellite remote-sensing experts. The European Commission was also involved. The outcome of the discussions will be summarised in a white paper that will make some recommendations on future action. The necessity of space lidar instruments is sure to be featured in the paper, said Dr Ken Holmlund, the head of Eumetsat's meteorological observations division. "Esa will look into its future missions now to see if there is some tweaking that can be done or some additional instrumentation or further improvements that should be taken onboard," he told BBC News. "And from a Eumetsat perspective, this really emphasises the crucial role of the Meteosat Third Generation mission which is now being debated. This was a clear message for me that for future volcanic monitoring, you really need good observations from geostationary orbit; and for Europe, it will be MTG or nothing." The 3.5bn-euro MTG is one of Europe's flagship space endeavours of the coming decade. It will replace the current Second Generation spacecraft that return 15-minute updates on the state of weather systems over Europe. MTG will incorporate more advanced technologies, including sensors capable of making highly detailed measurements in the infrared and ultraviolet/visible parts of the spectrum. A glimpse of MTG's capability was seen in the IASI and GOME-2 instruments on Eumetsat's Metop spacecraft that returned remarkable atmospheric composition data during the recent Eyjafjallajokull event. As a polar orbiting spacecraft, however, Metop sees Europe approximately only once a day. Derivatives of IASI and GOME-2 will go on MTG but in its geosynchronous orbit will have the advantage of being able to stare constantly at Europe. In the short term, Dr Holmlund said, there was an acknowledgement that much more could be done with existing sensors and data to provide better information to the national Volcanic Ash Advisory Centres (VAACs) which issue the atmospheric warnings to the aviation sector. What was clear from the Eyjafjallajokull episode was the requirement not just to describe conditions, but to put some hard numbers on them, too. There was a need to develop new quantitative products, he argued. "Until now the data from the various missions have been used in isolation," he told BBC News. "We should try more to look at multi-mission approaches, bringing together all the available data in a more effective way to make better products. "What was demonstrated during this workshop was that the advice that has been given out by the VAACs has been very, very accurate in most cases; and this has been confirmed by aircraft measurements. "There were a lot of [aircraft measurement] campaigns going out from France, the UK and Germany, and in most cases the ash was confirmed to be where the satellite data saw it and the modelling had predicted it to be. We did a pretty good job." EU officials calculated recently that the losses to Europe's air and tourism sectors as a result of flight disruption caused by the volcanic eruption in Iceland could exceed 2.5 billion euros.